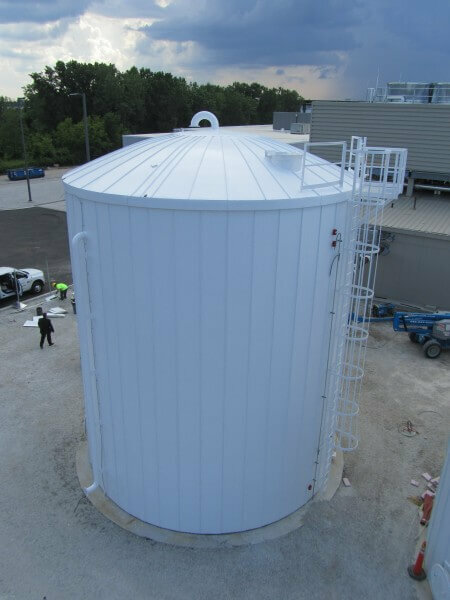 MC&I designed, manufactured and installed the RIDGLOK® Vertical Standing Seam Panel Insulation System on a chilled water storage welded tank, located in Franklin Park, IL. 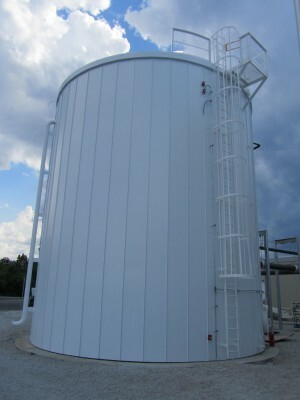 The welded storage tank was utilized to hold chilled water for a data processing facility. The storage tank was a 28′ x 32′ welded tank. The tank insulation project was completed on July 15, 2013. The RIDGLOK® Vertical Standing Seam Insulated Panel System consisted of 0.024 stucco-embossed aluminum metal jacketing, in White color, laminated to 3″ thickness of polyisocyanurate insulation board with a R-value of 20.3, using a radial roof system. The RIDGLOK® Vertical Standing Seam Panel Insulation system is used as a thermal barrier in chilled water storage tanks. Thermal Energy Storage Tanks require insulation systems to LOWER utility costs by reducing energy consumption. 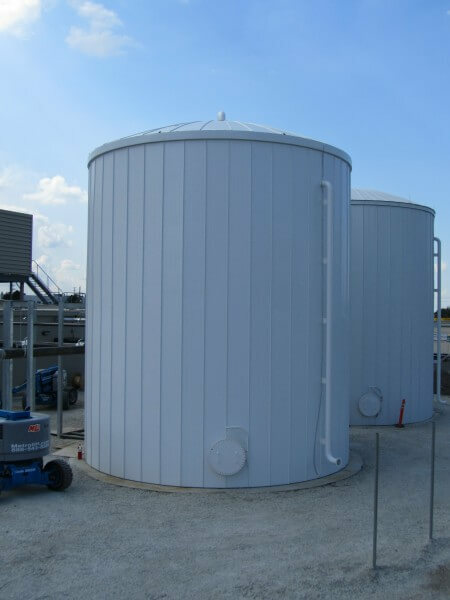 As these storage tanks are designed to cool the water by mechanical chillers using lower cost off -peak energy demand, the chilled water is distributed through the facility during peak energy demand. RIDGLOK® Vertical Standing Seam Insulated Panel System will PREVENT heat gain to benefit the Thermal Energy Storage Tank.